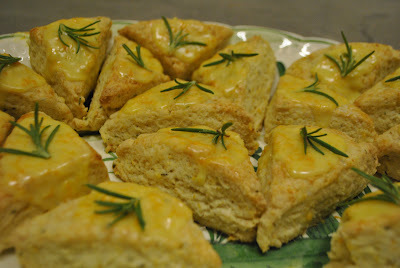 My favorite tea treat has to be scones. And a few of my favorites . . .
Cut in the American triangle shape. Somehow, I think the Brits would approve of that recipe! 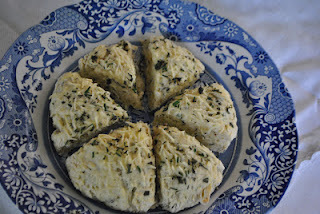 An herbal scone baked in a round pan and cut in wedges. Thanks to Rosemary House for their recipe. 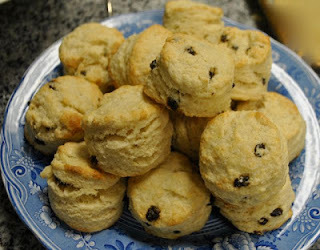 Yogurt scones -- similar to the cream ones only self rising flour and yogurt. 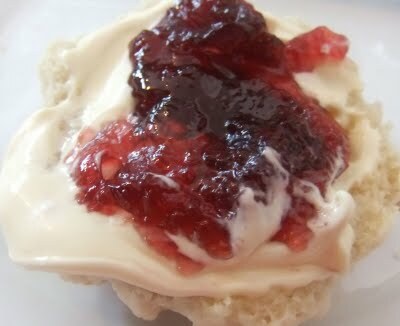 A tradition scone slathered in Devonshire cream and topped with jam. When we lived in England that spring, I had it as many times as I dared. Every tea room offered a "cream tea"
I wish those in America did, too! 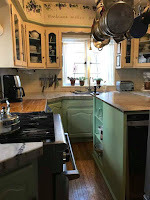 It's Tuesday and I'm joining Sandi at Rose Chintz Cottage for Tea Time Tuesday. You're right about only wanting to eat scones the day they're freshly baked. The outside has a crispness that gives way to a fluffy inside but a day later, all soft. A friend told me she toasts her day old scones, something I've never thought to do. Well, hello crispy outsides again and now I toast them until they're gone. 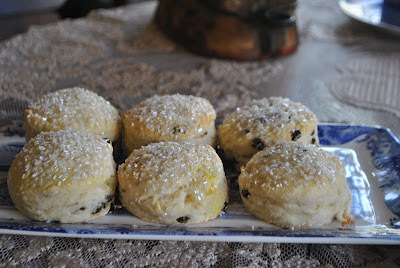 I could definitely have scones every day with my afternoon tea. I'm going to have to try the yogurt ones, that sounds intriguing! 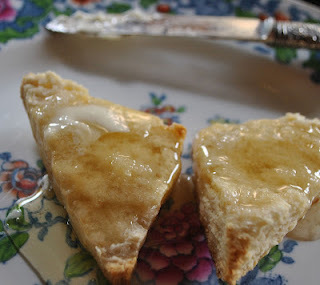 I often toast my leftover biscuits so I expect toasting leftover scones would also give good results. Nice to know! Would you mind providing the recipes for the whipping cream and yogurt scones? Also, do you use baking powder in your round scones. They are so pretty and high!! 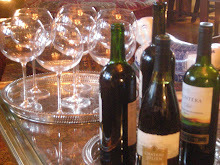 I sitting here drinking coffee this afternoon instead of tea. . .but I do wish I had a scone to go with this!!! I love scones that bake up nice and high. I would love to know more about the 2 ingredient scones. You always share some beautiful food! Martha, does the Devonshire cream we buy in the stores here (that seems to have an unlimited shelf life before it is opened) taste the same as what you found in England? 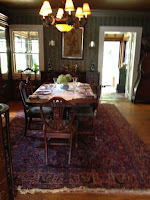 Some of my fondest memories from my trip to England also revolved around afternoon tea and scones. The 3:00 cream tea always warmed me up and helped me make it to a late dinner - it was a special time of day which I always looked forward too - especially because it allowed me to visit so many delightful tearooms. 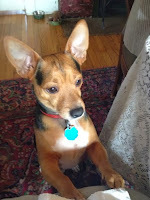 Please pass the scones.... I'll have one of each! Don't they all look so yummy! They all sound and look delicious, Martha! I end up freezing my scones, thawing them and then reheating in my toaster oven. I need to eat them warm, crisp on the outside and fresh on the inside.